As the title says, objects that are either components or groups tend to disappear at random when running Pro Walker GPU. On one render an object will be there, load it again and it might be gone. No rhyme or reason to it. Deleting the object and pasting right back in fixes that disappearing object but another might pop up at random and sometimes I don't notice until the render is complete. Very frustrating. Happens on multiple model files. Yes this is a very frustrating bug. We are definitely aware of it, though I'm not sure what the status is as far as getting a permanent fix. But this is the gist of it: It has to do with coplanar faces. 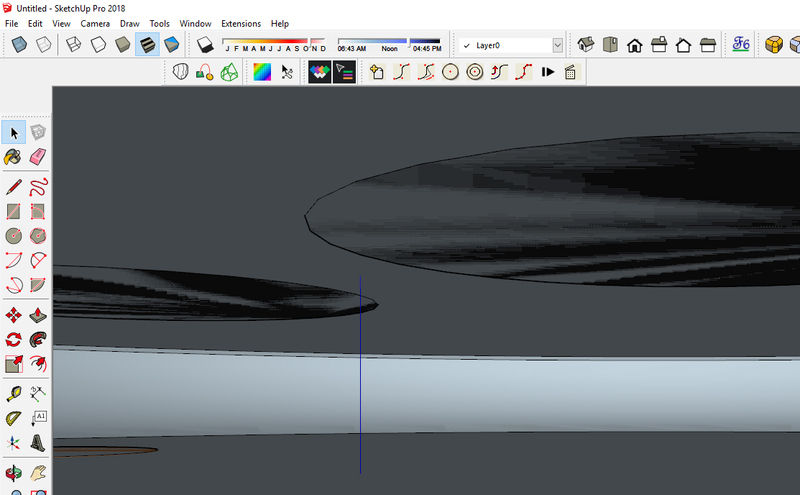 So if you have two groups or components, and there are surfaces that share the same plane in 3d space, there is a chance that one of the two items won't appear in the render. 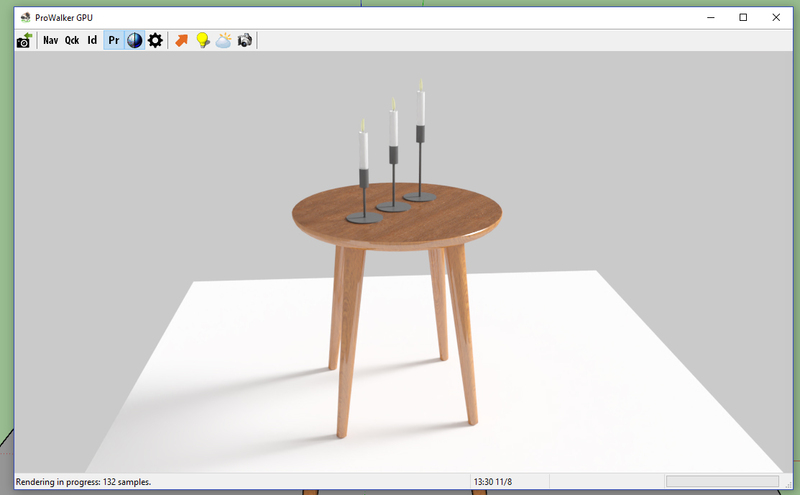 So say you have a table, and then you place a candle component on top of the table. If the bottom face of the candle is coplanar with the surface of the table, one of them may not show up. The fix is to either raise the candle by 1-2 mm (which is good practice anyway because it usually adds an appealing contact shadow), or embed it slightly into the table. And I know those bottom faces are coplanar with the table, because you can see the "z-fighting" if you zoom inside the stool. So my understanding of this bug has to be incomplete, I'm just not really sure what the missing information is. But sorry it hasn't been formally documented. TLDR - The workaround is to make sure there is either a gap, or some point of intersection between problematic groups/components. - Disappearing objects are always components, not just random groups or ungrouped objects. - So far it's always been a component that has multiple instances in the same model (a table and chairs in a cafeteria seating, for example). - Simply deleting and re-insert the components "fixes" it. Until it happens again (see below). - Tends to be the same components over and over again when they do disappear. That's interesting! It seems to indicate that there might be something specific about how those components are configured. Are they Browser components, your own, or from 3dW? One example has been the "Hay table set". But to make it even more complicated, I only used the chairs from that set and added them to a different table, which is the "Viccarbe_Table_Aspa_H73d80". Haven't had an issue with it for a while now actually. - Perhaps, like Justin outlined above, one of these nested components is suffering from the coplanar issue? If those components are repeatedly causing the problem, what happens when you explode them? Can you keep a version with the non-exploded components please? They've not caused any problems for me since they vanished one time and I deleted/reinserted them. If it happens again I'll report back. I'm working on a new model from scratch for a different client and now that I'm at the initial render setup stage, the disappearing objects happened right away. The QUICK fix it do delete the object in SU and re-paste it back in where it was. This time, right after I did that, a different object was gone on the next render run. Really, zero rhyme or reason here- feels like I'm just chasing random runaway objects. I can't replicate it. I tried the method dwhere I just raised the object up a few inches but it still didn't show up- only re-pasting worked. Must be interacting with something else, but what else that is is anyone's guess. All I can for sure say is that the objects have been groups, not components. But that could change. The fact that the missing objects are only groups is very helpful. What happens when you convert them to components? Does that fix it? I'd say it's likely something to do with groups, not components. I say this because the initial post where I noted the browser components by name- those were components within a group. Just now, they were simply objects in groups. That being said, I have plenty of other groups in my models both with and without components within them that have been fine. Happy bug squashing! Added a new component and it went MIA. I added two of the same component side by side, both were gone. So I went back and exploded one of them. The exploded component rendered. This problem only began at the beginning of last week, have never encountered it before and I use walker on a daily basis. The only interim solution I have found is to explode all groups and components before sending off to walker. groups/ components that share co-planar faces with other groups/ components will disappear from the ProWalker/ Iray rendering. Justin's image of co-planar items is correct. You can either push-pull one of the planes so it's not exactly co-planar or move it slightly. this can be tedious if you have a lot of co-planar groups. But in my experience all groups that are have faces that are co-planar with another group will be ignored in the rendering. Yes, all groups. So if you had a floor that had a bunch of tables that share a co-planar face with the floor, the floor and all the tables would be ignored. Jim suggested Nudge and use the Z axis to slight more the table a couple of millimeters above the floor. That might work. This is something we are investing on how to fix. It may be an Iray issue. If that's the case we need to come up with a utility that fixes co-planar faces. Fingers crossed for a fix. Can be quite tedious in a 30k sq. ft. model of a grocery store with so many components/groups. Thankfully, it's usually only a few items that initially give me grief and I can chase them down relatively quickly.